Strong eyebrows have been a trend in the make-up world for quite a while now but it hasn't been one that I have always embraced. Mainly because I had them already. I was blessed with thick and long eyebrows thanks to my granddad. As I already had the eyebrows, I never really bothered to do much with them as I did not want them to look too intense caterpillars on my face. Since the age of 16, I have put in more effort into my eyebrows - when I got them waxed for the first time, I felt like a different person. Whilst I still don't go for full out drawn brows, I like to keep them looking tidy especially as the hairs are quite long. These are the products that I am loving to help tame the caterpillars. I am not a fan of using brow pencils as I find they can be a little too intense for actually filling the eyebrows. Instead, I prefer to use creamier formulas as they are often a lot easier to blend and not as intense. My current favourite is one that I have actually had for a long time and keep going back to and that is the Maybelline Eyestudio Brow Drama Pomade Crayon in the shade Medium Brown. Although I have dark brown hair and eyebrow hair to match, I will always go for a medium brown shade as I don't want to end up with Morticia eyebrows. As it is a pomade formula, it also helps to keep the eyebrows in place - although I will still need a brow gel on top as long eyebrow hairs like to do their own thing. 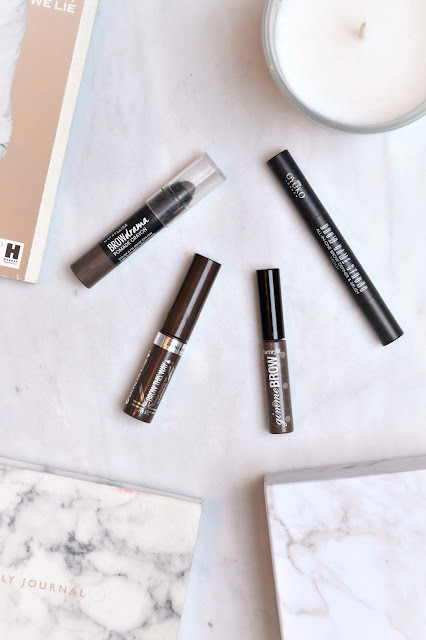 Last week, I started using the Eyeko Brow Game Strong All-In-One Brow Game Changer in the shade Medium which I was very kindly given through work. It has a creamy brow powder in one end and then a brush in the other. It is really easy to use, even with my long eyebrow hairs and lasts really well. As it is an all-in-one product, it would be great to take in your handbag if you are going out in the evening after work and wanted to top up or intensify your look. Now like I said earlier, I will always need to use a brow gel to keep these monsters in place. I have used clear brow gels in the past but I just found they never really did anything. The best brow gel that I have found so far is the Benefit Gimme Brow which unfortunately is not available anymore and I haven't tried the new 3D Browtones yet, mainly in fear that it won't be as good. When my Gimme Brow finally bites the dust, I guess I will have to brave enough to give Browtones a go - if you have tried it, please let me know your thoughts in the comments. If Benefit is a little out of your price range, the Rimmel London Brow This Way Gel in Medium Brown is a pretty decent drugstore alternative. It is ever so slightly lighter than my Gimme Brow but for the price, you are getting a pretty decent eyebrow tamer. My only slight criticism is that the wand can be a bit clumpy sometimes so I always make sure to get off any excess before I start taming the eyebrows. So these are the products that I like to use to tame the caterpillars that live on my face. If you have tried anything mentioned in this post or if there is any eyebrow products that you cannot live without, let me know your thoughts in the comments!